Begin sitting tall with your legs extended out in front of you. From here, bend your right knee and cross your foot over your left thigh; bend your left knee and draw your left heel to your outer right hip. If any part of the right foot lifts off the floor, step your right foot to the inside of your left knee. Bring your right fingertips to the floor next to your right hip, and inhale as you lengthen your spine. Keep the length, and exhale as you twist to the right, initiating the twist from your back left ribs. Use the twisting action itself to go deeper; avoid hooking your elbow right away and using the arm for leverage. 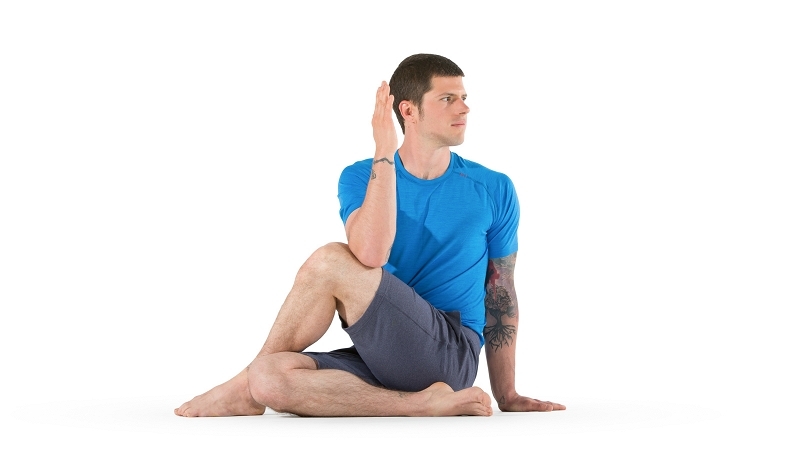 Instead, wrap your left arm lightly around your knee, and continue to lengthen with each inhale—perhaps even backing off the pose momentarily—and exhale to find a little more twist. Then, if you like, bring your elbow outside your knee. You can find a little resistance here, pressing knee against elbow, elbow against knee, but be sure to maintain the length in your spine and the twist in your belly instead of collapsing and letting the arms do all of the work. You can turn your head to the right if that feels comfortable. If you find that you're collapsing in your lower back and unable to sit up straight, sit on a folded blanket. If you're pregnant, twist in the opposite direction (away from the bent knee instead of toward it).